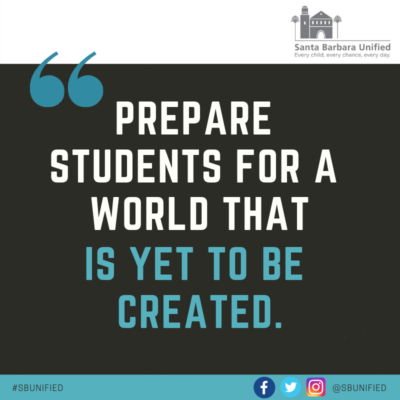 The Santa Barbara Unified School District Board of Education adopted a new mission, vision, and core values. The new statements move to focus and align the district with planning documents that drive school board decisions and district operations such as the district’s Local Control Accountability Plan and School Plans for Student Achievement. When Santa Barbara Unified School District Superintendent Cary Matsuoka specifically asked a room full of teachers, principals, and district staff if they could recite the district’s previous mission statement from memory, no one could. “We recognized that it was time to develop a mission statement that staff, students, and families could remember, be proud of, and that could truly impact the day-to-day operations throughout our schools,” said Matsuoka. The new vision statement is “students read, reason, and communicate to contribute positively to an ever-changing world.” The vision statement supports the school district’s commitment to literacy, development of cognitive skills and is aligned with new State standards for college and career readiness. While the core values are newly adopted, the priorities were not new to the district as they have become widely known and quoted throughout the district over the last two years: equity, improving our practices, and evaluating our work. Equity reflects the belief that all students have the capacity and desire to learn. Improving our practices demonstrates a belief that everyone should be committed to growth and improving their work. Evaluating our work expresses that the district will regularly review data and feedback to improve all practices. The statements were developed in concert with and through cycles of review by the school board at public meetings, among district leaders, with the Teaching and Learning Advisory Committee, and the Teacher Induction Program. The statements made a preliminary debut at San Marcos Day the district’s annual gathering of all staff at the opening of the school year, during the annual State of the School community presentation in the Fall, and at a Board of Education student voice listening session.